Based on that, Fannie Mae and Freddie Mac were deemed incapable of handling legal matters and the government was appointed to take care of these matters. So what is the government handling actually? The same source tells us, “… at the end of 2006, Fannie Mae and Freddie Mac had about $4.3 trillion of mortgage credit exposure, which was about 40% of total outstanding mortgage debt in the U.S. (March 15, 2007). Or viewed differently, the two companies have $5.2 trillion of debt and MBS obligations outstanding, exceeding the $4.9 trillion of publicly held debt of the U.S. government, according to the Federal Reserve's board of director's Chairman Ben Bernanke (April 2007).” Yikes, that’s a lot to handle. But wait, Fannie Mae (in 1938) and Freddie Mac (in 1970) were both created by acts of Congress. It appears, then, the government created two GSEs (government sponsored enterprises) that became unable to oversee and deal with legalities. So the government stepped in. I am reminded just a bit of the department of redundancy department. Bu that may be about to change and possibly in a big way. No matter which party wins the White House and Congress, this one is bound to happen, and soon. After all the talk, in the end Fannie Mae and Freddie Mac will become fully-privatized companies and returned to their shareholders because it's the easiest thing for the government to do. So what will happen? Will anything happen? An answer was given by American businessman Joseph Jackson, born in 1929. Say it with me, “It’s all about the money”. Now I must digress just a bit. For today’s laugh, check out these Top 100 Money Quotes of All Time from Rob Berger in Forbes and pay special attention to numbers: 1, 8, 15 and especially (my personal favorite), 32. You’re welcome. WHY are they in conservatorship? “Federal officials on Sunday unveiled an extraordinary takeover of Fannie Mae and Freddie Mac, putting the government in charge of the twin mortgage giants and the $5 trillion in home loans they back. In short, then, Fannie and Freddie were losing, well, their fannies, so the government stepped it to fix the problem (and I say that past part with some sarcasm). That mild sarcasm is based in part on ramifications such as this one from abcnews.com, “Taxpayers take on trillions in risk in Fannie, Freddie takeover”. “The unprecedented federal takeover of mortgage giants Freddie Mac and Fannie Mae announced on Sunday is a bold attempt to stabilize financial markets and restore the faltering housing market, but it thrusts trillions of dollars of risk directly onto taxpayers' shoulders. Yes, It’s all about the money but, as it happens, it may be our money? Well, isn’t that usually the case? But all of that controversy surrounds the original decision to establish the conservatorship. Now that talk has started about dissolving the conservatorship, the controversy has continued and often in a more heated way. Read more about this presumed inevitability from Housing Wire in Why conservatorship of Fannie and Freddie must end, or this DSNEWS piece Was Watt’s Speech the Beginning of the End for the Conservatorship or numerous others articles with strong similar opinions. “There is a big fight over this notion, should we have the government in the housing market or not? Should we just get the government out and let private capital, if you consider big banks to be private capital, finance the housing market? What would the mortgage market look like without that? And how do we — how do we move forward? Ms. McLean, by the way, is NOT in favor of dissolving the conservatorship. 1. Move Fannie Mae and Freddie Mac from conservatorship to formal bankruptcy. 2. Repeal both entities’ perpetual federal charters and replace them with three-year charters that Congress may renew if necessary. 3, Separate both portfolios of mortgage investments and turn them over for gradual liquidation to a new temporary subsidiary of the Federal Housing Finance Agency (FHFA) modeled after the Resolution Trust Corporation, which handled the assets of failed savings and loans in the 1980s and 1990s. Liquidation should proceed as the market allows, and neither entity should be allowed to make any further portfolio purchases. 4. Reduce the conforming loan limits. These limits indicate the maximum size of the mortgages that Fannie Mae and Freddie Mac are allowed to purchase for inclusion in mortgage-backed securities. 5. Increase the fee that is charged for a federal guarantee that mortgages will be repaid if they are included in bonds issued by Fannie Mae and Freddie Mac, and use that money to repay taxpayers for the cost of their bailout. 6. Move all low-income housing goals and subsidies to the Department of Housing and Urban Development (HUD). Congress should then determine whether each of these policies should be continued, combined with others, or eliminated. Programs that are continued would be funded through the appropriations process. 7. Sell remaining parts of Fannie and Freddie to private entities. Such sales would not be based on geography. Certain parts would be reserved for sale to small banks, credit unions, or smaller mortgage bankers to reduce the chance of the business again being dominated by large companies. 8. Require continuing congressional oversight to monitor these changes and the development of a modern housing finance system. But almost immediately, we saw, “Investors Unite fires back at WSJ columnist in Fannie, Freddie recap row”. Specifically, “Carney is wrong in claiming that Fannie and Freddie can't rebuild capital. HERA allows Director Watt to suspend dividend payments to the federal government for this purpose. Carney is also wrong to say that allowing them to rebuild capital is allowing them to come back to life without addressing the flaws that previously existed. First, HERA addressed these flaws and the entities have been reformed. Second, it's still up to policymakers (specifically Federal Housing Finance Agency) to determine the outcome of the conservatorship. Carney's logic that the sweep protects the taxpayer more than allowing Fannie and Freddie to rebuild capital makes no sense. We don't allow any large institutions to operate with no capital. 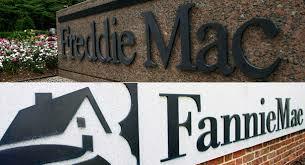 Why are Fannie and Freddie any different? Perhaps, then, this needs more study. The Hill Bill (love that) agrees, sort of. “The GSE Review and Reform Act, H.R. 5505, would direct the Treasury Department to study ending the conservatorship of Fannie Mae and Freddie Mac on an annual basis.